It’s Time To Update Your Curtains For The Spring Season! Particularly in areas where the four seasons are distinctive and most definitely separate, some individuals may actually want to change out at least a portion of their window treatments to celebrate the knowledge that spring is finally upon us. But it’s not just the weather that causes some people to shift gears. The heavy, cold darkness that can be associated with winter needs to give way to more colorful and light valances, floral patterned curtains, lace, and sheers in order to adequately celebrate the season of all things new. 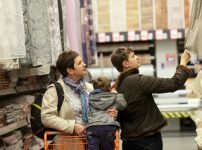 Let’s look at getting fresh curtains for the spring season. Sheer curtains are a spring favorite in many a household. You can maintain most of your privacy yet still allow warm spring sunlight to grace your home. Sheer curtains in a vast array of colors can be used for virtually every window combination and size and can be placed under an existing treatment or used all by themselves. Lace curtains are another spring favorite which are also available in a variety of styles and, as their sheer friends, can be used under an existing treatment or all by themselves. Traditional ivory or white lace curtains offer an old world charm no matter what the decor. Tailored valances, scalloped valances, and tie-up shades are some of the options from which to choose when incorporating a sheer valance or a lace valance into your window treatments. Trying to avoid the hassle of layering curtains with triple and/or double curtain rods? One of the easiest ways to frame the windows in your home could be with valances. Though they can be used over drapes and curtains panels, valances can also be used by themselves. 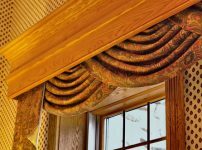 Additionally, a variety of patterns, colors, and styles are available to make your shaped, lined, and layered valances spring to life. Many homes have window frames that have seen better days. The perfect solution is, of course, to refurbish or replace them. This is neither a timely nor cost-effective method in many cases. Rather, jabot or swag curtains can hide damaged, worn out window frames and, depending on the size of your window, are available in various lengths. Most of the nasty window frame will be hidden thanks to the swooping style of these shades on either side of the window. And, let us not forget grommet curtains. Ideal for every season, these hang elegantly from your choice of decorative rod and can be drawn closed effortlessly. They will not get snagged on the curtain rod thanks to their design which incorporates a metal grommet (ergo the name) through which the curtain rod is placed. Be it spring or summer, you can draw your grommet curtains to whatever position you wish, depending on how much light and warmth you desire. Ready to update your curtains for the spring season now? Talk to us at Vogue Window Fashion!